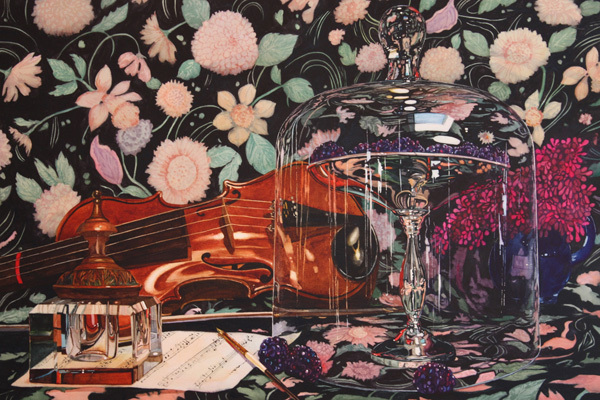 My violin, ink-well, silver dish, and sheet music sit beautifully on the floral-patterned tablecloth that makes up an interesting and balanced motif for this still-life painting. These objects are some of the many antiques and collectables that I have in my home. 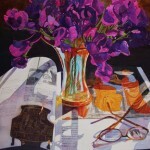 In this painting I have combined many different surfaces and textures to create visual interest. 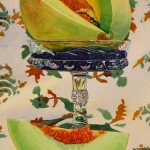 This painting was exhibited at the Rocky Mountain National Watermedia Exhibition in 2012.